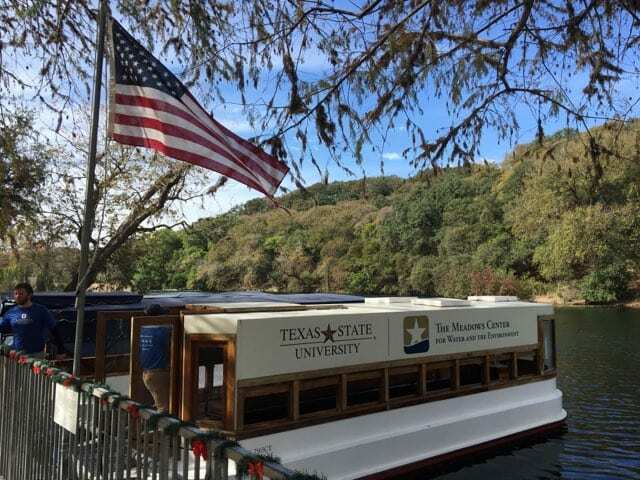 For a fun little family day trip, take the kids down to The Meadows Center for Water and the Environment at Texas State University in San Marcos to explore Spring Lake on a glass-bottom boat tour. 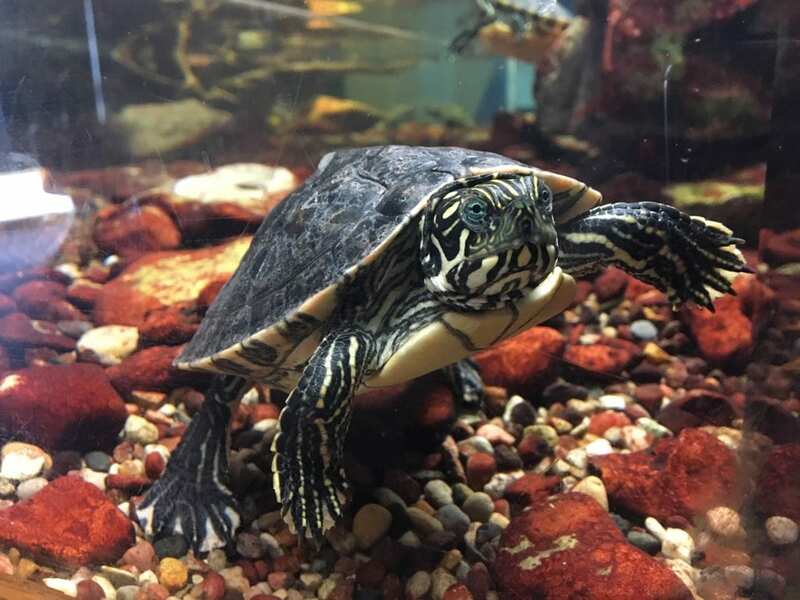 Fascinating for all ages, our family loved spotting turtles, fish and the bubbling springs! 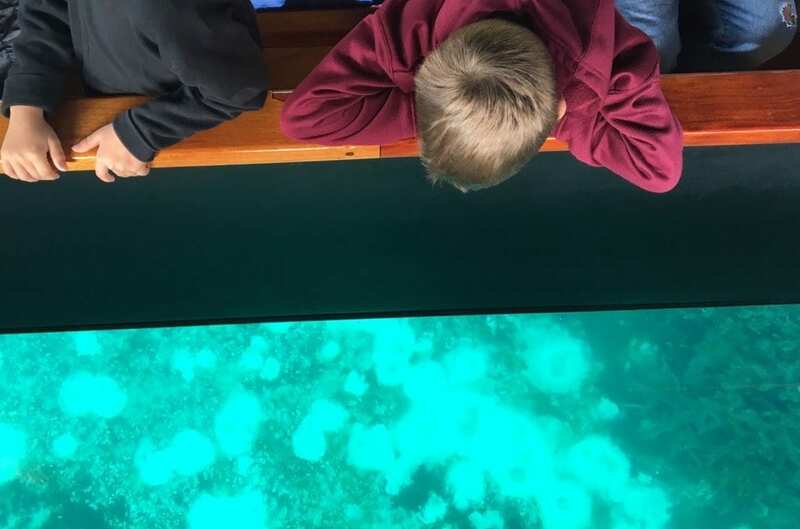 Spring Lake (headwaters of the San Marcos River) contains hundreds of springs with water from the Edwards Aquifer, but you can’t really get a great perspective of the what lies beneath the lake’s surface until you hop aboard the glass-bottom boat. 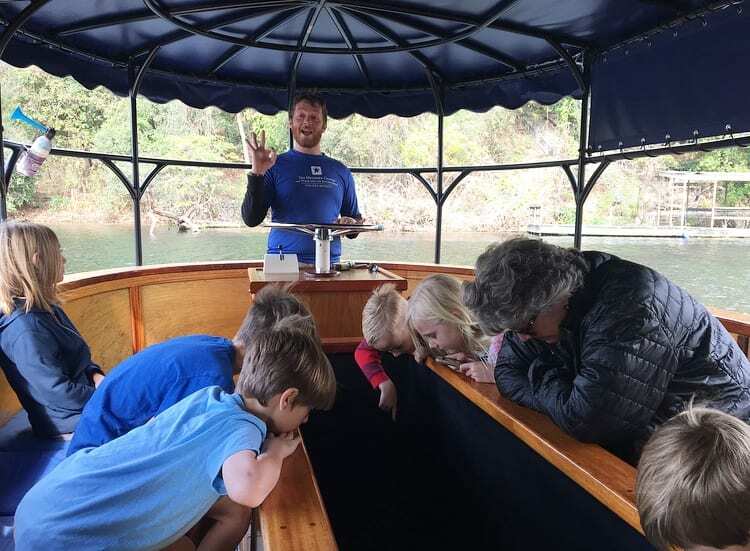 Peeking into the window panel at the bottom of the electric-powered boat, you can see beautifully clear water, as well as close-up views of fish, turtles, prawns and species found only in Spring Lake or the San Marcos River, such as the endangered Texas Blind Salamander. While on the tour, you’ll also hear a little bit about the interesting history of this area. The glass-bottom boats have been taking visitors around Spring Lake since 1945. This area was also once home to Aquarena Springs, an amusement park that featured “mermaids” and a swimming pig (among other things) that could be viewed underwater in a submarine theater. We wish we could travel back in time and get a glimpse of that! 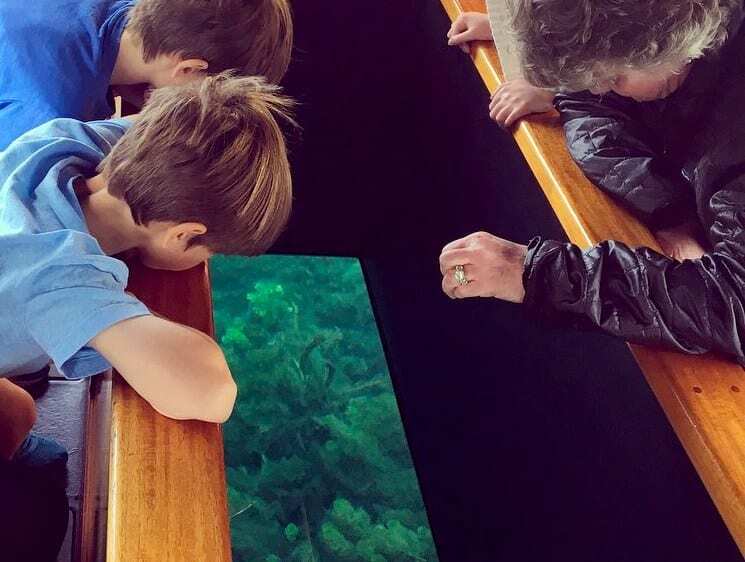 Glass-bottom boat tours are offered daily, running continuously every 30 minutes. 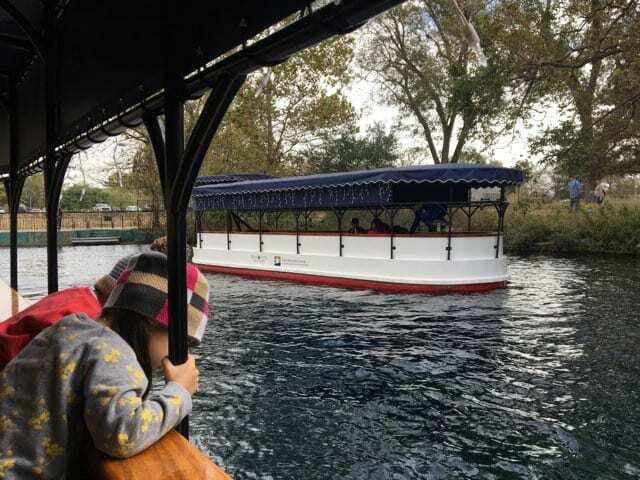 Tickets for a 30-minute ride are $9.75 for adults, $8 for seniors, $6 for children ages 3-12 and free for ages 2 & under. Learn more here. After the boat tour, we made our way into the Meadows Center’s Discovery Hall, which is free and open to the public. Inside you’ll find a 1,000 gallon aquarium of native fish found in Spring Lake, an endangered species exhibit where you will see Texas Blind Salamanders, San Marcos Salamanders and Fountain darters, a baby turtle aquarium, and an interactive exhibit about the Edwards Aquifer and the Water Systems of Texas. 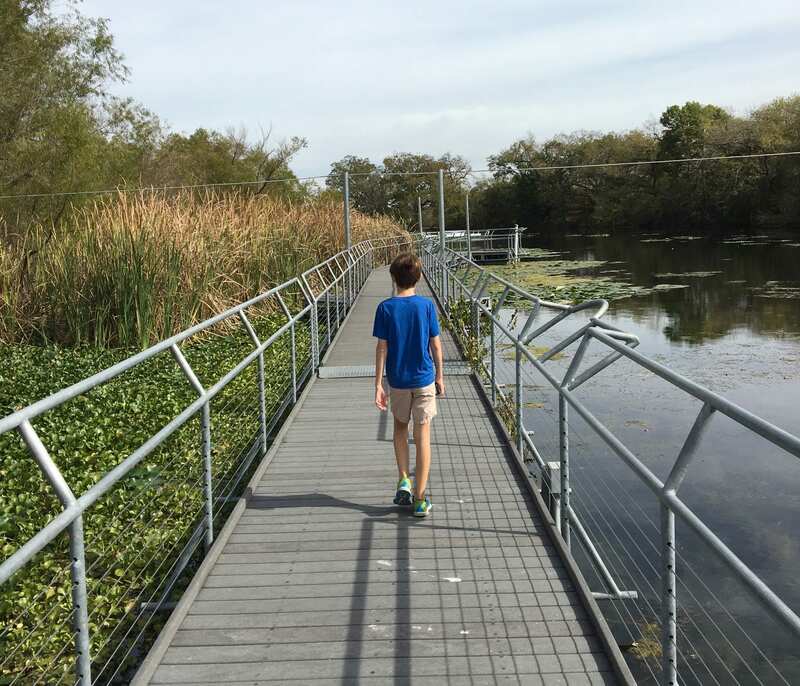 Afterwards, we took a stroll along the Wetlands Boardwalk, where you can take a walk along the water, taking in more views of the plants and animals found in this area. The Meadows Center hosts paddling tours, as well as a scuba diving program. 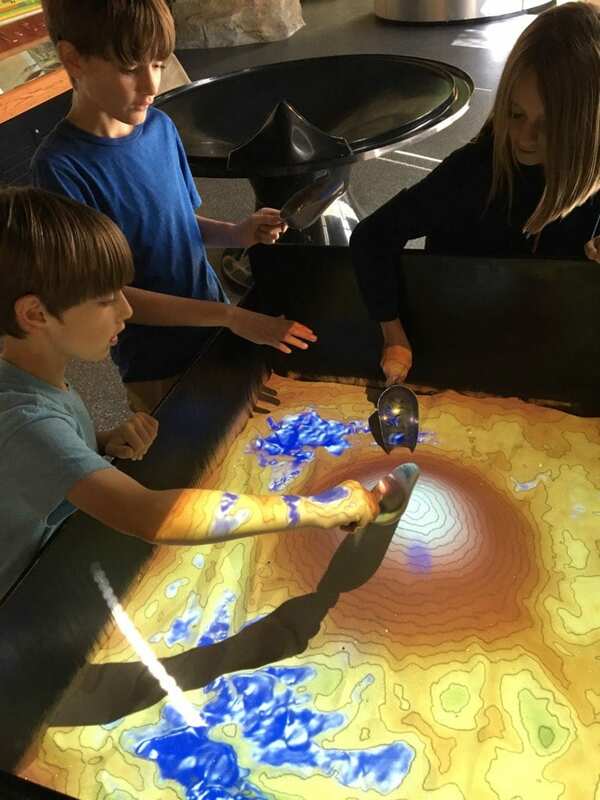 You’ll also find a variety of educational events, from field trips, to scouting and homeschool programs, nature playtime for pre-K children, and more. We hope your family enjoys a visit to The Meadows Center as much as we did! For much more info, please visit www.meadowscenter.txstate.edu.